PHILIPPINES, May 23, 2013- Filipinos might be among the most active netizens on social media, but when it comes to shopping it seems tradition remains a hard habit to break. According to the latest Readers Digest Trusted Brand Survey 2013 (RDTB Survey), only 17% of the Filipino respondents have significantly changed their shopping habits despite the rising number of online stores in the last two years. The RDTB survey, carried out for the 15th consecutive year, reached out to 7,000 respondents across seven markets across Asiaincluding India, Thailand, Malaysia, Singapore, Hong Kong,Taiwan and the Philippines. Among the Asian countries, Filipinos are the most likely to shareboth their positive (8%) and negative (7%) brand experiences on social media accounts (e.g. Facebook, Twitter, forums). In comparison, only 5% of all the Asian respondents will often share their brand experiences online – only 4% of respondents will share positive experiences and only 3% will expose negative ones. Surprisingly, however, despite the Filipinos keen participation in online discussions, the survey revealed that only 7% of respondents are very likely to trust comments regarding brands or products that they observe on social media platforms. Although online shopping has not had much influence on shoppers’ habits in the Philippines, the impact of online shopping on Asian shoppers is even less. According to the RDTB survey, only 13% of Asian respondents have seen significant changes in their shopping habits owing to online options. Out of all the consumer product and services categories (all broadly classified under five main sectors – Travel Services, Clothing and Other Apparel, Books and Media, Entertainment Services, Vouchers and Online Coupons surveyed), online travel services appear to be the most popular with the respondents in the Philippines, Singapore and Malaysia, while those surveyed in Taiwan, Hong Kong, India and Thailand ranked clothing and apparel purchases as their top online shopping option. Among Filipino respondents, Travel Services accounted for 33% of the total purchases online followed by consumer electronics at 20% and vouchers and online coupons at 17%. Clothing and other apparels and books and media online both account for 15%. The RDTB survey covered 42 product and services categories. 68% of all respondents in the survey agreed that the results of this survey will help them in their purchasing decisions. 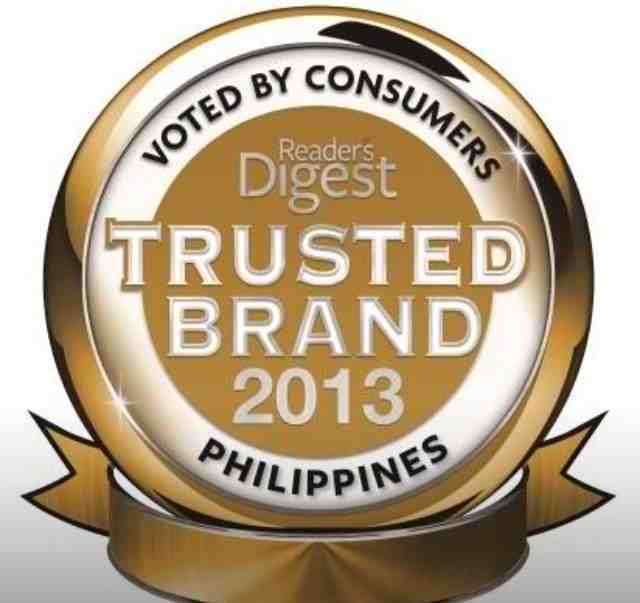 The Reader’s Digest Trusted Brand 2013 winners come from diverse industries such as food and beverage, personal products, finance, motoring related, consumer electronics, health and personal care, household products, retail, education, transport, travel and telecommunications. They were chosen based on the six attributes of trustworthiness and credibility, quality, value, understanding of customer needs, innovation, and corporate social responsibility. Out of the 91 winners 45 are local brands including household names such as Jollibee,PLDT, Magnolia Chicken, Monterey, DMCI Homes, BPI, Century Tuna, Argentina, Camella Homes, St. Lukes Medical Center, Condura, Banco De Oro and SM. 1. Few Filipino respondents trust online comments regarding brands and products. Only 7% of the respondents in the Philippinescompared to the Asian average of 8% will very likely trust comments regarding brands or products which they observe on social media platforms. Taiwan scored 1 per cent in this respect – the lowest. 2. But the Philippines ranked first among the seven countries who would share both their positive and negative brand experiences on social media. 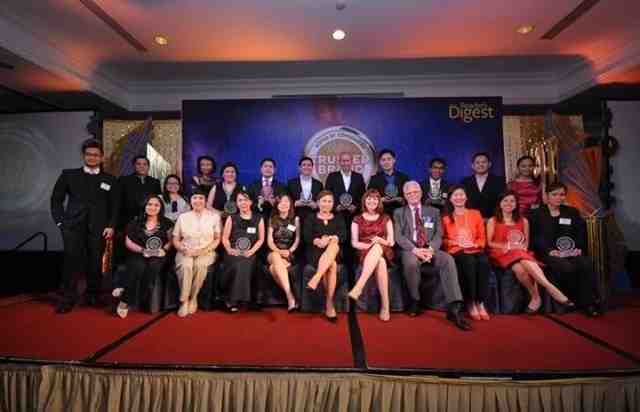 The winners received their Reader’s Digest Trusted Brand 2013 awards on May 23, 2013 at the Edsa Shangri-La Hotel. The Awardees of Reader’s Digest Trusted Brands 2013 with (4th to 7th from left) Reader’s Digest Commercial Director Yvonne Tey; Reader’s Digest PH Advertising Director Maricarl Garcia; Reader’s Digest Asia Pacific Editor in Chief Sue Carney; and American Chamber of Commerce of the Philippines Executive Director Ebb Hinchliffe. 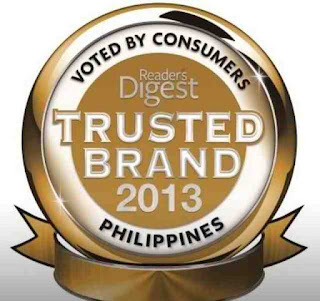 Now on its 15th consecutive year, The Reader’s Digest Trusted Brands survey, is one of the most representative and transparent consumer surveys in Asia with trusted brand results brought about solely by consumers’ unsolicited brand recall and attribute scoring. In the survey, 7,000 respondents were interviewed in Asia with 1,000 of them from the Philippines. Conducted by Ipsos, the world’s third largest market research company, the survey provides valuable insight into the decision making processes of consumers while at the same time seeks to give due recognition to outstanding market performers. The Reader’s Digest Association, Inc. is a global multi-brand media and marketing company that educates, entertains and connects audiences around the world. The company, which celebrates its 91st Anniversary this year, uses its marketing, editorial and content-delivery skills to serve communities of customers. With offices in 38 countries, it markets books, magazines, music, video and educational products to a customer database of more than 140 million in 75 countries. It publishes 75 magazines, including 49editions of Reader’s Digest – the world’s largest-circulating magazine, operates 62 branded websites generating, and sells approximately 30 million books, music and video products across the world each year. It is headquartered in New York, USA. Reader's Digest Asia's website is www.rdasia.com.